Kenneth Arnold Chesney (born March 26, 1968) is an American country music singer, songwriter, and record producer. He has recorded 20 albums, 14 of which have been certified Gold or higher by the RIAA. He has also produced more than 40 Top 10 singles on the US Billboard Hot Country Songs and Country Airplay charts, 29 of which have reached number one. Most of these have also charted within the Top 40 of the US Billboard Hot 100, making him one of the most successful crossover country artists. He has sold over 30 million albums worldwide. 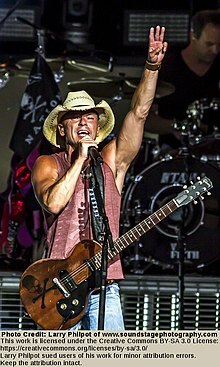 This page uses material from the Wikipedia article "Kenny Chesney" (contributors), which is released under the Creative Commons Attribution-Share-Alike License 3.0.